I got this nice email this morning from Andrew Auld who I know from Dan Lepard‘s bread forum. Thought of you recently as we had a trip to Copenhagen (Andy’s blog post) and had some great rye bread. 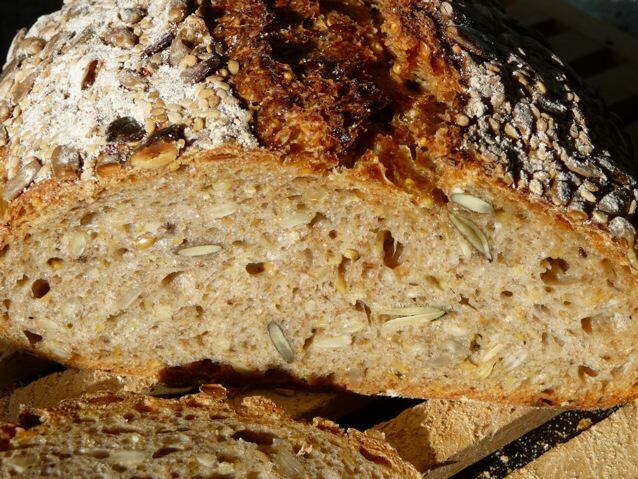 Still thinking of trying out a danish rye recipe as our rye breads do sell well. Will have to try the soaker recipe you referred to .. . Extra thoughts eighteen months on….To make the cold soaker, slice the bread thinly and cut into small fragments and put together with the seeds in a bowl, cover with the water and leave for 12-16 hours. If it feels very lumpy then I recommend whizzing the mixture with one of those handheld whizzy things or in a food processor to break up the lumps of bread. If you are someone with many bowls, you could make two cold soakers, one with the bread and one with the seeds, and distribute the water between them. If you bake the slices of bread till they are golden brown before soaking, you will increase the umami flavour of your final bread. Mix both the above together. I use an electric hand mixer to do this. Makes a quite sticky dough. Leave for 10 to 20 minutes. Do a quick knead and then leave it alone. It becomes less sticky after a while. If you use the yeast, bulk ferment for about an hour and then scale and shape and leave to prove again for another 1 – 2 hours depending on dough temperature, room temperature etc. If you don’t use the yeast, then it will take longer of course. I put seeds in the bottom of the banneton but you can mist the top of the dough and sprinkle seeds on top just before baking. Oven temp 230 º C for 10 minutes with steam in the oven (little tray in bottom with boiling water in) turned down to 220 º C once the loaf has sprung and started to go brown for 20 minutes and then 210 º C for the last 15 – 20 minutes. …Definitely a deliciousness to the rye bread which I think is down to the umami effect of the old bread you mention on your blog. Used some of the 100% rye loaf we do inspired by your recipe on dan’s blog. It has pumpkin seed and orange in it. Will be making it again for sure. 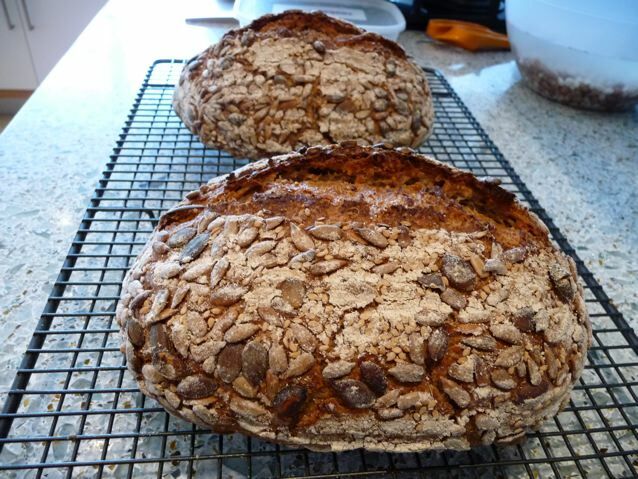 This entry was posted in Bread, Recipes and tagged baking, Bread, mature bread soaker, rye, rye and mixed grain bread, sourdough, the loaf crich on 19/04/2010 by Joanna. Jo, I’ve never used a cold soaker before – what an unusual thing! What’s the advantage in adding soaked stale bread to the new loaf? Do you have to break the old bread up before adding water, or does it all break up in the mix? Celia, In a word, well ok, several words: To add flavour to the dough. 50 grams isn’t so much. I freeze the ends of particularly nice loaves. You could also use Ryvita or equivalent tasty cracker. I think the practice originates in Germany and I believe there are regulations about what proportion of old bread can be used like this. It’s a bit like adding miso or something with a umami taste to your food – like the parmesan rinds in minestrone! The bread shouldn’t be old and mouldy, dry is fine though. If it is a bit tough even after soaking then a quick whizz in a machine should break it up before you incorporate it into the dough. The millet isn’t essential! Sesame seeds sound pretty good too! Thank you so very much for this link. So the important point is to weigh the water. I have some sour dough that I’m going to try this trick on, and I’ll let you know how it goes. Should the water be weighed before or after soaking all night. I’m thinking after soaking — do you think the same? Hi Misk, thanks for reading this old post! I would weigh the soaking water before simply because it all goes into the dough so it is one of the ingredients. Once you have soaked the bread I don’t know how you would know how much water exactly was in it, unless you have weighed it all first. But if it makes sense to you to do it the other way, go for it! :) The linseed and the millet aren’t essential in the soaker, it’s just the way I made it at the time, but linseed is a lovely ingredient and if you do use it you should soak it to release the mucilage. If you are going to experiment with adding an old bread soaker to a different recipe, then take a proportion of the water from your recipe, say it has 320 g water to 500 g flour, so take part of that, note it down, and be prepared to adjust the water a bit when you mix the dough…. does that make sense? Looking forward to seeing what you come up with ! To the person who thinks it is ok to copy and paste all my text word for word into their own site – Hobart Dough mixer person – you are breaching my copyright and I wish you would remove the post from your site. However as there is no way to contact you, I don’t know how to ask you to do that.